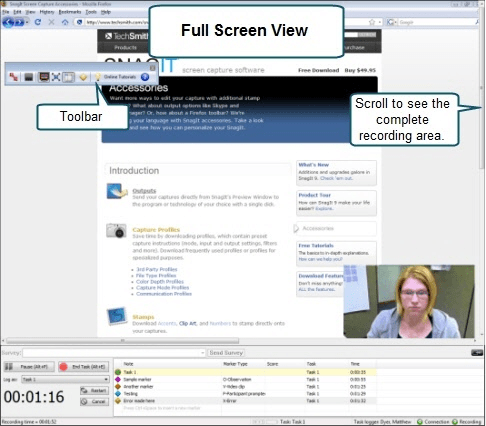 To help you view the recording more easily, Morae allows you to customize how you view and log a session. To make it easier to view the recording, you may need to adjust the way the video appears in Observer. You can view the screen and/or camera video being captured in several ways. Try the different views to find one that works well for your test. You can adjust the view at any time, prior to and during a recording. By default, the interface opens in the Normal view. 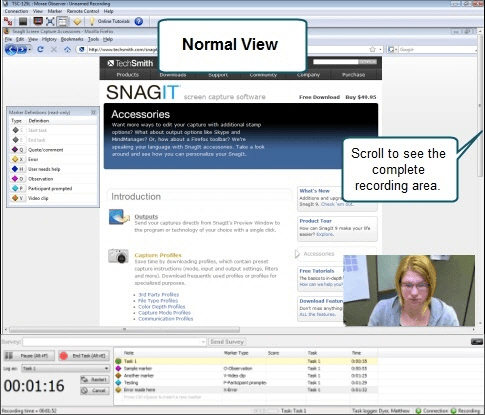 This view shows the recording activity within a regular window. The toolbar, status bar, menu bar, Marker Definitions window, and PiP window are visible by default. The Full Screen view fills the entire screen with the recording and a floating toolbar appears. Choose View > Full Screen. 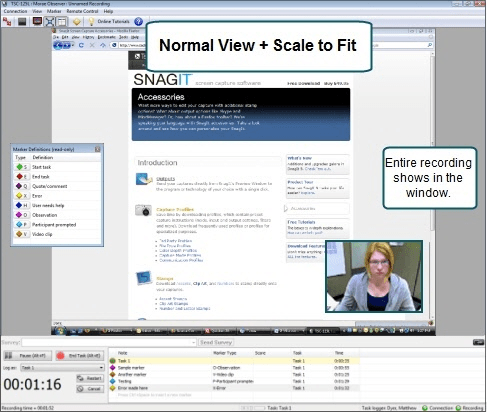 If the recording is larger than the Viewing window, choose the Scale to Fit view. This view fits the entire recording into the Viewing window. This option is available in both Normal and Full Screen view. Click the Toggle Scale-to-Fit button. Choose View > Scale to Fit. 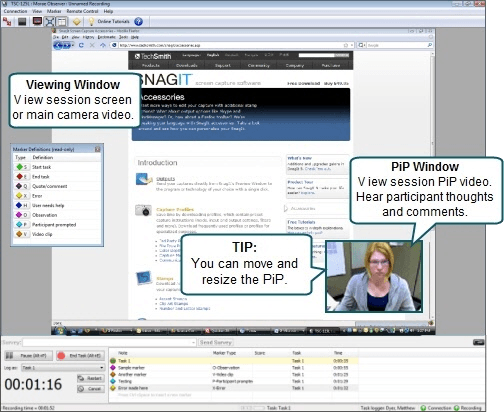 When recording begins, a window containing the Picture in Picture (PiP) camera video appears by default in the lower right-hand corner of the viewing window. You can move and resize the PiP window in the Viewing window. PiP is best viewed with the Scale to Fit option turned on. If you can't find the PIP window, choose View > Scale to Fit and the PiP window appears in the lower right-hand corner. Click in the PiP window and drag it to a different location. Point at a corner of the window with your cursor and grab the handles that appear. Drag the corner out or into make the window larger or smaller. Choose View > Picture in Picture (PiP). The Marker Definitions window displays the markers defined in the study configuration that you can use to log events during the recording. To log a marker, click a button in the Marker column. 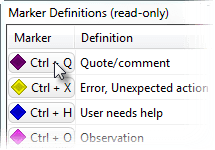 The Marker Definitions window is visible by default in Observer. To hide the marker definitions, choose View > Marker Definitions.